In a bowl, combine the nut butter, honey or maple syrup, vanilla if using, and rolled oats or rice cereal. Stir until well combined. Score the mixture into quarters and form four balls out of each quarter (for a total of 16 balls). Place the balls on a baking tray lined with parchment paper. Place the baking tray in the fridge or freezer to set while preparing the chocolate. In a double boiler (see notes below) or small saucepan, melt the chocolate chips or chocolate bar pieces on low heat. Stirring often until smooth and completely melted. Remove the balls from the fridge or freezer. Place 1 or 2 balls into the melted chocolate, and using a spoon, gently roll each ball around in the chocolate until completely covered. Use a fork to remove each ball from the chocolate, letting excess chocolate drip off, and place back onto the baking tray. Continue with the remaining balls. Once finished coating the balls with chocolate, place the baking tray in the fridge or freezer, allowing the chocolate to harden, about 10-15 minutes. Once hardened, transfer the balls to a storage container and store in the fridge or freezer. If sensitive or allergic to nuts, use seed butter such as pumpkin or sunflower seed butter. To save on time, skip the chocolate coating and mix the chocolate in to the rest of ingredients before forming into balls. 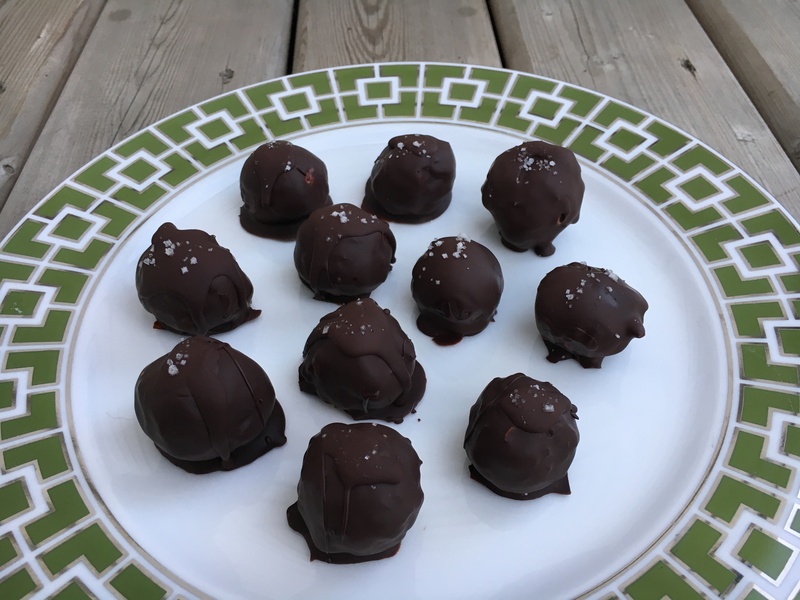 For a sweet and salty flair, sprinkle the tops of the balls with a small amount of sea salt after they are removed from the chocolate. Create a double boiler: place a small saucepan filled with about ½ inch of water on medium heat and bring the water to a low simmer. Place a heatproof glass or metal bowl to fit on top of the saucepan and add the chocolate to begin melting. **It is important that the bowl is not submerged in or in contact with the water. Aim for about 2-3” between the bottom of the bowl and the water. The steam from the simmering water will gently heat the chocolate.